There's always something new happening at Control Developments - keep up with our news & events below! As you can see, we have taken a long hiatus to focus on research and development. Many changes have taken place at Control Developments since July 2016. We've had a regular stream of Year in Industry students, currently housing Daniel Starkey and Marcus Corbin as trainee engineers, Mike Hudson, our electronics engineer, and Gennie Beavan, the new Office Manager and Business Administrator. We are keeping up appearances now, and the website will be updated regularly, thanks to Gennie's website development knowledge. It's good to be back! After learning the ways of Control Developments, it was time for the 2015-2016 students to return to their respective universities to finish their degrees and let some fresh new students take their place. The first of the new students to attempt to live up to his predecessors is Max, a prospective Engineering student. Control Developments has recently acquired, through a separate holding company, two associated companies, Quantum Dynamics Ltd., and Aqua Data Ltd. Quantum Dynamics make a special purpose optical densitometer used for measuring optical density in wet-film X-rays. Aqua Data makes a sophisticated flowmeter based on the Faraday Electric Field Principal. Having no moving parts the sensor is robust, accurate and has a very high resolution. Both these products compliment and expand the range of products as well as provide new and innovative features. Control Developments is passionate about developing engineering excellence in the UK, and supports many types of learning and experience programs for students of a wide age range. In July we said a sad farewell to out two students Patrik Toobe and Tom Birch who had been with us for a year and now go on to the universities of their choice. Both Patrik and Tom have impressed us immensely - with a positive attitude, a willingness to learn, and the desire to improve. I am convinced that they will go to university far more informed, more mature and with a work ethic that one does not see often nowadays. We wish them all the best for the future, and hope they may want to return to the Company during their holidays. By way of compensation we have just had two new students join us, both of whom have completed 2 years at university and wish to enjoy the benefit of a Year in Industry placement. They are Steven Ellul, who is studying Computer Science at Coventry, and Sam MacDonald who is studying Electronics at Nottingham. We hope they will have a pleasant and fruitful time at Control Developments, and will have to warn them that their predecessors set a very high standard! Every now and then we like to reward our great team for their hard work - the last time it was a January ski trip in Switzerland. 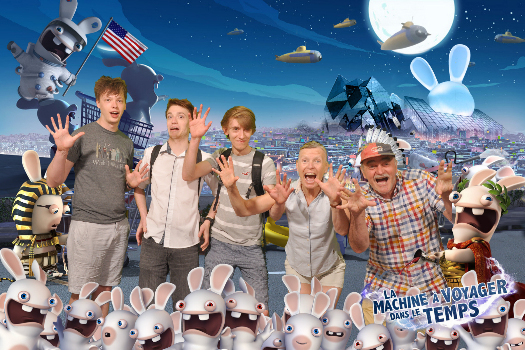 This time we took (most of) the guys for a long weekend in France for a break of nice food, nice wine, and a trip to the Futurescope theme park near Poitiers. The photo shows (left to right) Thomas, Patrik, Tom, Helen, and Brian. Two of our people, Gary Crawford and Ian Grimwade, sadly couldn't make it, but the rest present made up for it! The last character on the far right, the one with the dental issues, is not part of the team. During our recent quality audit, Control Developments received approval to ISO 9000 by BSI Quality Assurance for the third year running, with no faults or corrective actions required. This was of course exactly what we expected! It reflects the Company's commitment to providing goods and services of the highest possible quality, as well as maintaining internal management systems that ensure we fully understand out processes and obligations, and have a customer-orientated improvement system. Control Developments moves to a new office at The John Galt Building in Eynsham. Tom Birch and Patrik Toobe join Control Developments as part of the Year in Industry Program. Ian Grimwade re-joins Control Developments after more than a decade. Control Developments develops autonomous Automatic Buoyancy Compensation Device. controldevelopments.com begins maintenance and updates. Control Developments begins a partnership with IDEAdvance, working together on innovative new sensing techniques for brushed electric motors. Gary Crawford joins the company as Development Engineer. Thomas Stenhouse-Pyne joins the company as a Development Engineer. Control Developments' quality managment system achieves ISO 9000 certification. Control Developments moves to a new office located in Hanborough Business Park.